The BEST FREE LIFETIME Technical Support on the Internet! Response to your inquiries within just a few hours! Technical support even on most weekends!!! Free product updates on new builds! And now you can even talk to us live (click on the Live Help image)! Instant phone & email support is now available via Priority Support Service! The special offer prices are valid through Mar. 31, 2019! Get additional 30% off when you purchase any product(s) over US$150! 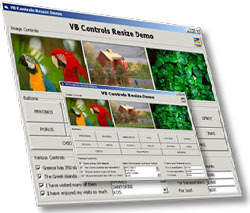 ActiveResize Control is the BEST SELLER VB form resizer control on the planet! ActiveResize Control is now offered at less than half the price of other resizer controls, but with a lot more features, greater performance, support for all types of controls and data grids, and easier implementation within your VB projects! The fastest .NET windows forms resizer control on the planet! Active Resizer .NET Control is an intelligent .NET windows application form resizer control that makes your .NET windows applications completely resolution-independent, with absolutely no coding! The control run-times are totally royalty-free! VBGold Active Resizer .NET control is a fully-automatic VB.NET / C#.NET / VC++.NET windows application form resizer control that automatically detects the screen resolution on the user machine (at run-time) and will automatically resize and reposition your application forms and its controls so that they look exactly that same on the user machine, as they look on the development machine, using the exact aspect ratio of the form in proportion to the screen dimensions. Similarly, it will resize and reposition all controls on your .NET form when the form is resized either by the user or through code. Whenever its parent form is resized, the control automatically detects this event and performs an exactly proportional resizing and repositioning on all the controls on the form without requiring you to write even a single line of code! Active Resizer .NET control can handle virtually any type of controls! It also handles complex controls like the SSTab Tabbed Dialog control, Grid controlss, as well as both the Microsoft FlexGrid (MSFlexGrid) and Hierarchical FlexGrid (MSHFlexGrid). The new version (2.x) also supports all types of Sheridan controls & Grids (SSDBGrid, SSOleDBGrid, SSDBCombo, etc. ), the Janus GridEx grid control, the ESRI MapObjects control (GIS control), the 3D Active Button Magic controls and the Innovasys FramePlus and ButtonPlus Free ActiveX controls. It also supports the MS Toolbar control and the MS Calendar control. Active Resizer .NET control is very light-weight and has been perfectly optimized for maximum processing speed, resulting in a perfect ultra-fast resizing / repositioning process that is completely invisible to the user. VBGold Active Resizer .NET control is the fastest form resizer control on the planet! Its code has perfectly been optimized to achieve the highest performance possible. This means that the user of your application will never see the controls changing their sizes and positions when he/she resizes the form. 100% flicker-free resizing & repositioning process (unlike most form resizer controls) even when resizing pictures! Makes your applications completely resolution-independent. They will look exactly the same on all screen resolutions. Automatically resizes and repositions all form controls when forms load or resized without the need to write any code. The control automatically detects the Load and Resize events of its parent form and resizes / repositions the controls. Precisely Resizes and repositions the controls with exact proportions to the changes in the form size. Your forms will look exactly the same when they are resized. Allows you to specify whether the font size of control captions, control text and grid cells text of the controls should be resized when the controls are resized. Allows you to exclude any control(s) from being resized, repositioned or its font get resized. This gives you full control over the entire resize process. Allows you to save the current form state (its position and size/position of all controls) and restore the form state at any later time with only one line of code! Can handle every new control created on the form at run-time. Can handle any type of controls on the form, even graphics controls such as Image and Picture controls, Chart controls as well as Line and Shape controls. Can handle controls nested within other (container) controls. Can handle complex controls like the Tabbed Dialog Control (SSTab control) and all controls on it. Can handle all data grid controls like the DataGrid, DBGrid, MSFlexGrid, MSHFlesGrid. All columns in these controls are resized proportionally to the new size of the control. Supports all types of Sheridan controls & Grids (SSDBGrid, SSOleDBGrid, SSDBCombo, etc.). Supports the Janus GridEx grid control. Fully supports the ESRI MapObjects GIS control and does not distort the spatial extent for calculating coordinates (very essential to a proper GIS system). Supports the MS Toolbar control, MS Calendar control and the ProgressBar control. Supports the 3D Active Button Magic controls. Supports the Innovasys FramePlus and ButtonPlus Free ActiveX controls. Automatically resizes the form background picture to the actual size of the form at run-time (when the form loads or is resized) even if the original picture is smaller or larger than the form area. Automatically resizes the contents (image) of all PictureBox controls on the VB form. Enables you to specify a minimum and maximum size for your forms. At run-time, the form can not be resized smaller or larger than the specified minimum / maximum size. This ensures that all controls on the form will be appropriately visible. Enables you to prevent the from from being minimized and / or maximized. Ready to be used in your existing applications without the need to write or modify any code. Works on all 32-bit and 64-bit versions of Windows and can be used in any .NET language. Great processing speed and flicker-free resizing even on very slow (old) computers. The control run-times are totally royalty-free! You purchase just one license and distribute thousands of copies of the control with your applications! It will pay for itself thousand times! Note: Multiple developers must purchase multiple licenses (one license per PC). Purchasing a site license enables you to use the control on an unlimited number of development PCs. The fastest VB form resizer control on the planet! ActiveResize Control is an intelligent VB form resizer ActiveX control that makes your Visual Basic applications completely resolution-independent, with absolutely no coding! VBGold ActiveResize control is a fully-automatic VB form resizer control that automatically detects the screen resolution on the user machine (at run-time) and will automatically resize and reposition your VB (Visual Basic) application forms so that they look exactly that same on the user machine, as they look on the development machine, using the exact aspect ratio of the form in proportion to the screen dimensions. Similarly, it will resize and reposition all controls on your VB form when the form is resized either by the user or through code. Whenever its parent form is resized, the control automatically detects this event and performs an exactly proportional resizing and repositioning on all the controls on the form without requiring you to write even a single line of code! ActiveResize control can handle virtually any type of controls! It also handles complex controls like the SSTab Tabbed Dialog control, all types of Microsoft DB Grids and Data Grids, as well as both the Microsoft FlexGrid (MSFlexGrid) and Hierarchical FlexGrid (MSHFlexGrid). The new version (3.x) supports all types of Sheridan controls & Grids (SSDBGrid, SSOleDBGrid, SSDBCombo, etc. ), the Janus GridEx grid control, the ESRI MapObjects control (GIS control), the 3D Active Button Magic controls and the Innovasys FramePlus and ButtonPlus Free ActiveX controls. It also supports the MS Toolbar control and the MS Calendar control. In addition, it automatically resizes the form background picture to the actual size of the form even if the picture is smaller or larger than the form area. ActiveResize control was perfectly optimized for maximum processing speed, resulting in a perfect ultra-fast resizing / repositioning process that is completely invisible to the user. VBGold ActiveResize control is the fastest form resizer control on the planet! Its code is perfectly optimized to achieve the highest performance possible. This means that the user of your application will never see the controls changing their sizes and positions when he/she resizes the form. Works with SDI, MDI child, and MDI parent forms. Works on all 32-bit versions of Windows and can be used in Microsoft Visual Basic (5 & 6). Great processing speed even on very slow (old) computers. ActiveResize was tested on a 133MHz Pentium PC with 128MB RAM, 2MB Graphics Adapter RAM, with Windows 2000 Pro. OS and has displayed an equally great performance! ActiveResize Lite is a free ActiveX control that makes your VB forms completely resolution-independent without the need to write any code! ActiveResize Lite is a Free version of the award-winning ActiveResize Control! ActiveResize Lite automatically resizes your VB5 & VB6 forms and their controls when your application runs on a different screen resolution from the resolution that was used when the application was developed (in the VB development environment). ActiveResize Lite does this without requiring you to write a single line of code! ActiveResize Lite also automatically resizes and repositions all controls on a Visual Basic form when the form is resized either by the user or through code, with absolutely no coding! ActiveResize Lite is freeware. You can freely use it in your applications including commercial applications. We will appreciate it if you give credit to VBGold Software when you use this control in your applications. Advanced PDF Printer provides such great features as printing multiple PDF files in "one shot" by just calling a single printing method, batch printing PDF files from a specific folder while supporting wildcards, batch printing PDF files using a list file where each PDF file can be sent to a different printer, using just a single method call! 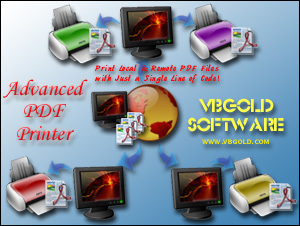 Advanced PDF Printer can be used from virtually any programming language, including VB (Visual Basic 6 & 5), VB.NET, ASP.NET, C#.NET, VC++.NET, J#.NET, VBA, MS Office (MS Word, Excel, Access, PowerPoint), ASP, HTML, VB Script, Java Script, VC++, Delphi or any other programming language! The component run-times are totally royalty-free! Advanced PDF Printer is an intelligent, All-In-One PDF file printing tool (ActiveX Component DLL) that greatly simplifies printing PDF Files (Portable Document Format) from within your desktop applications and web applications, or even from your custom controls and components that you develop. It enables you to print one or multiple local or remote PDF files using just a single line of code! Your PDF files can be sent to any selected printer installed on the machine, including network printers! The actual printing you get is "WYSIWYG" (What You See Is What You Get) and is exactly the same as that you get by printing from the free Adobe Reader application, with all the formatting, fonts, images, graphics, etc., preserved! Advanced PDF Printer provides such great features as printing multiple PDF files in "one shot" by just calling a single printing method and passing multiple file names in a string to that method, batch printing PDF files from a specific folder by just calling a single method once, while supporting wildcards and wildcard patterns in file names, batch printing PDF files using a list file where each PDF file name in the list file can refer to a file located at a different path, drive or even on a network share, while each file can be sent to a different printer, with a specific number of copies, using just a single method call! With Advanced PDF Printer, not only you can print your local PDF files, but you are able to even print remote PDF files that are located over the web (e.g. on web servers or remote machines) or over any other network (e.g. LAN, WAN, VPN, etc. ), on the client machine, with just a single line of code and without the hassle of writing complex code or using third party controls to download the files from the remote servers to the local machine and using another tool to print the files! It can't be easier when it comes to printing remote PDF files on the client machine! Advanced PDF Printer supports all types of printers that can print PDF files from Windows. It supports both local printers and network printers. Local printers are supported regardless of their connection and port type (USB port, LPT Parallel port, COM port, IEEE 1394 port, etc.). Network printers are also supported regardless of their connection, including Ethernet printers, WiFi printers, IP-based remote printers, etc. Advanced PDF Printer provides several events that enable you to easily and accurately monitor and track the entire printing process. The events will inform you when each file starts printing and when the file printing is complete, the current file number and the total number of files to be printed, and even when an error occurs during the printing process, such as when the printer is offline or out of paper, a file is not found, etc. In addition, when printing remote PDF files from the web or other networks, on the client, you also get notified when each file starts downloading and when the download is complete, or even when there is a problem pulling down the file from the remote server. Advanced PDF Printer also enables you to automatically query all the printers installed on the machine, including their driver names and port names. In addition, you can even change the default system printer in Windows, on-the-fly from within your code, by just calling a single method! Advanced PDF Printer can be used in any programming language that supports ActiveX components (COM DLLs), such as Visual Basic .NET (VB.NET), C#.NET, VC++.NET, Visual J#.NET, ASP.NET, ASP, VB4 (32-bit), VB5, VB6, VBA, MS Office applications (Word, Excel, Access, PowerPoint, etc. ), Visual C++, Delphi, HTML, etc. To start using Advanced PDF Printer in your project, just add a reference to the component in your project, or create the object on-the-fly by using the CreateObject(...) method (in VB, VB.NET, ASP, ASP.NET, VB Script, etc.) or the equivalent method in other programming languages. Print single or multiple PDF files (batch printing) with tremendous ease, using just a single line of code! Print both local and remote PDF files that are located on web servers or on any other type of networks (e.g. LAN, WAN, VPN, etc.) using just a single line of code!!! Remote PDF files are printed on the client using just a single line of code! !...without the hassle of using third-party controls for file download and other controls for printing (this is a real All-In-One tool for PDF file printing)! Print PDF files to any selected printer by just specifying the printer name (the object will automatically get the printer name and other printer information for you). Batch print multiple PDF files by just calling a single method and passing the file names in one string. Batch print multiple remote PDF files on the client by just calling a single method and passing the file URLs in one string. Batch print PDF files from a specific folder by just specifying the folder name and calling a single method. The object will automatically find all PDF files under that folder and will print them one by one. Batch print PDF files located under a specific folder, while supporting wildcards and wildcard patterns (e.g. 2007*.pdf, Invoice*.pdf, ? ?2007*.pdf, etc.). Batch print PDF files using a list file (a plain text file that contains the names of the PDF files to print). Batch print PDF files using a list file, while sending each PDF file to a different printer, with a different number of copies. Supports printing PDF files on both servers and on the clients. Specify the number of copies to print for each PDF file. Get notified when each PDF file starts printing and when it completes printing. Get notified which PDF file is currently printing and the total number of files when batch printing multiple files. Get notified when each remote PDF file starts downloading and when it completes downloading. Get notified when an error occurs, e.g. printer is offline, is out of paper, a file is not found, remote server is unavailable, etc. Get notified when the entire printing process is complete (e.g. for batch printing). Specify a pause time period between consecutive file printing, in case your PDF files are very large or when printing a very large number of PDF files. Query the printers installed on the machine, including their additional information (driver name and port name). Change the default system printer in Windows on-the-fly from within your code. Print to all types of printers, including Inkjet printers, laser printers, dot-matrix printers, thermal printers, label printers, barcode printers, ticket printers, check printers, etc. Print to any local or network printer that support printing PDF files from Windows. Print to local printers regardless to their connection type and port (USB, LPT, COM, IEEE 1394, etc.). Print to network printers regardless of their connection type (Ethernet, WiFi, IP-based remote printers, etc.). Can be used from any programming language that supports ActiveX components (DLLs), including MS Visual Studio .NET (VB.NET, C#.NET, VC++.NET, J#.NET, etc. ), VB6, VB5, VB4 (32-bit), scripting languages (VB Script, Java Script, etc. ), VBA (MS Word, Excel, Access, PowerPoint, etc. ), VC++, Delphi, PHP, etc. Can be used from within web applications (can run on the server or from within a web page viewed in Internet Explorer on the client), from desktop applications, etc. Compatible with all versions of Windows including Windows 95, 98, NT, 2000, Millenium, XP, Vista and Windows 7. * The free Adobe Reader is required for the proper operation of the product! Send Raw Data And Native Printer Commands To Any Printer, From Any Programming Language, Using Just a Single Line of Code!... And Without Using Any Printer Drivers! Take full control of your printer! Send Raw data and native printer commands (ESC codes, ZPL commands, PCL commands, etc.) to label printers, ticket printers, RFID printers, barcode printers, cash registers, dot matrix printers or any other printer type including laser printers and inkjet printers. Raw Data Printer can be used from virtually any programming language including VB (Visual Basic), VB.NET, C#.NET, VC++.NET, VBA, MS Office (MS Word, Excel, Access, PowerPoint), ASP, HTML, VB Script, Java Script, VC++, Delphi or any other programming language! 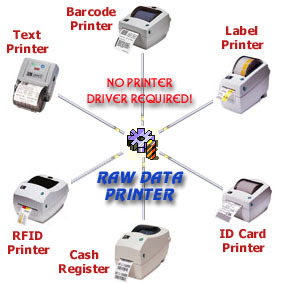 Raw Data Printer is an intelligent ActiveX component (DLL) specifically designed for sending raw data to any type of printers, including label printers, ticket printers, RFID printers, barcode printers and cash registers. It enables you to print raw data and send native printer commands (escape codes) directly to the printer, bypassing any printer drivers. You do not even need to have a printer driver installed on the system that communicates with the printer! And all this, is done using just a single line of code! No more pain with writing complex code or using special printer drivers to manipulate your printers to print raw data! Raw Data Printer is a unique component that enables you to control the entire range of printer functions directly from within your code by sending native printer commands (escape codes or any other commands) in any printer command language (e.g. standard ESC commands, ZPL commands, PCL commands, etc.). Moreover, it supports any custom printer commands not defined in any common printer command languages. Using Raw Data Printer is quite simple. It provides you with a few easy-to-use methods, where you just need to specify your data (and / or printer commands), or a file name and, optionally a printer name, and your data will be printed using just a single line of code! It can't be easier when sending raw data and commands to your printers! Raw Data Printer can be used from any programming language that supports ActiveX components (COM), such as VB (Visual Basic), VBA, VB.NET, C#.NET, VC++.NET, ASP (Active Server Pages), ASP.NET, HTML, MS Office (Word, Excel, Access, PowerPoint), VC++, Delphi, etc. Enables you to send raw data to your printers from within your application using just a single line of code! Enables you to send native printer commands to any printer (e.g. ESC codes), so you can control everything from within your code (e.g. font face, size, paper orientation, print quality, paper cutter, etc.) and whatever commands supported by your printer! Enables you to send raw data (as string) from within your code or specifying a file that contains the data, or even both at the same time! Thus, when printing a check or a ticket, for example, you can supply the customer data from within your code, while the remaining data to be printed are retrieved from a text file! Can print to any printer installed on the system, even if it is not the default system printer (you just specify the printer name when sending your data and it will go to that printer)! Can be used in any programming languages that support ActiveX components (COM objects) such as VB (Visual Basic), VBA, VB.NET, C#.NET, VC++.NET, ASP (Active Server Pages), ASP.NET, HTML, MS Office (Word, Excel, Access, PowerPoint), VC++, Delphi, etc. Print Your Documents, Reports, Files And Data From ASP Pages, ASP.NET pages, HTML Pages Or From Any Other Programming Language (including VB.NET, C#.NET and VC++.NET) Using Just a Single Line of Code! ASP Printer COM greatly simplifies your printing tasks in every programming language!. Print HTML forms and form fields from ASP & ASP.NET pages, print HTML Files, print HTML documents (pages) using their source code from within the web browser, print live URLs by just specifying the URL address, print data from HTML "INPUT" tags or any other tags in the HTML document, print your Reports, Text Files, Rich Text Format (RTF) Files, RTF Data, PDF Files as well as any text data, from within your ASP & ASP.NET pages, HTML pages, VB applications, .NET applications or any other programming language! ASP Printer COM is a 32-bit ActiveX COM component (DLL) that enables you to print almost anything from within your ASP Pages (Active Server Pages) & ASP.NET pages running on a web server or LAN server, without any user intervention. It also enables you to print your data and files from within HTML documents (pages) viewed in a web browser on the client system, in full color, with images and graphics and with the exact page layout and formatting (WYSIWYG - What You See Is What You Get). Printing is done with just a single line of code!... and without displaying any print dialogs! ASP Printer greatly simplifies your printing tasks such as printing HTML forms and form fields, printing HTML Files, printing HTML documents (pages) using their source code, printing live Urls by just specifying the URLs (e.g. http://www.vbgold.com/), printing data from HTML 'INPUT' tags or any other tags in the HTML document, printing Reports, Text Files, Rich Text Format (RTF) Files, RTF Data, PDF Files (Adobe Portable Document Format) as well as any text data, from within your ASP pages, ASP.NET pages and HTML documents (pages). When installed on a web server or a LAN (Local Area Network) server, ASP Printer will enable you to print anything you like from any of your web sites running on that web server. For instance, you can print order forms that your customers fill online, immediately after the order form is submitted. Printing tasks (documents) can be sent to any printer directly connected to the web server, or to any shared printer connected to the Local Area Network where the server is connected. ASP Printer also enables you to print whatever you like on the client machine that browses your web site. Just use the HTML 'OBJECT' tag in your ASP or HTML page and a couple lines of code, and the ASP Printer component will automatically be downloaded and installed on the client machine and will print whatever you like on the client machine. With ASP Printer, you no more need to write complex code to figure out how to format each part of your document to fit on the paper, based on the fonts and font sizes used, type of printer, paper size, orientation, document margins, number of pages required, etc. With ASP Printer, you just supply the document contents or file name and you are done. Your documents are printed exactly as you see them in a web browser, in a word processor, or in Adobe Reader, preserving all document layout (WYSIWYG - What You See Is What You Get), including any images and graphics and in full color! ASP Printer provides you with a number of easy-to-use methods, where you just specify your document data or file name and optionally any desired settings such as font settings, margin settings, etc. and your document will be printed using just a single line of code! It can't get easier with printing from your ASP and HTML pages! ASP Printer also provides you with great flexibility in printing your documents, by allowing you to query all local and network printers, select a printer, specify print quality, paper size, orientation, paper bin, print margins, line spacing, etc. Take a look at the great features of ASP Printer. When printing with ASP Printer, the document is sent directly to the printer or to the print spooler without displaying the standard Windows Print Dialog. This enables you to use ASP Printer on web servers and similar machines where you need to automate printing tasks without any user intervention. 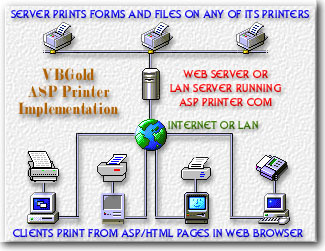 In addition to printing from ASP and HTML pages (with VB Script or Java Script), ASP Printer can be used to print documents from any other programming languages that support ActiveX components (COM), such as VB (Visual Basic), VBA, VB.NET, C#.NET, VC++.NET, ASP.NET, MS Office (Word, Excel, Access), VC++, Delphi, etc. Prints your documents with WYSIWYG (What You See Is What You Get), using the specified document layout and formatting such as font settings, margin settings, image locations, etc. Prints data supplied from within your code, such as text data, RTF data, images, contents of HTML 'INPUT' tags or any other HTML tags, etc. Enables you to specify whether to print page numbers, print a border around the document with a specified line width, include the current (system) date and time in the document footer, print a separating line below header and above footer with a specified line width, etc. * For PDF file printing, the free Adobe Reader is required! Greatly simplifies printing tasks in your VB projects, VC++ projects, Delphi projects, VBA, MS Office applications (Word, Excel, Access, PowerPoint) and in HTML pages! Print Your Text Files, Text Data, RTF Files, RTF Data, HTML Files and PDF Files With Just a Single Line of Code! Smart Print Control is a 32-bit ActiveX (OCX) control that greatly simplifies printing tasks such as printing Reports, Text Files, Text Data, Rich Text Format (RTF) Files, RTF Data, HTML Files, HTML documents from their source code as well as PDF Files (Portable Document Format) from within your Visual Basic (VB) applications, VBA (Microsoft Word, Excel, MS Access, PowerPoint, etc. ), Delphi, Visual C++ applications and from your HTML documents (pages), with just a single line of code! If you are a Visual Basic developer, you already know the headache associated with using the VB Printer object to print your text documents, where you need to write complex code to figure out how to format each line of text to fit on the paper, taking into account the font type and size used, type of printer, paper size, orientation, document margins, number of pages required, etc. With Smart Print Control, you just supply the document title, document text (body), and optionally document header and footer, at design-time or at run-time and you are done. Alternatively, Smart Print Control enables you to easily print any Text file, RTF file, RTF data, HTML file, HTML document or PDF file using just a single line of code! It can't get easier with printing from your Visual Basic applications or any other applications that support ActiveX (OCX) controls! Smart Print Control provides great flexibility in printing your documents, by allowing you to query all local and network printers, select a printer, specify print quality, paper size, paper orientation, paper bin, print margins, line spacing, etc. Take a look at the great of Smart Print Control. When printing text documents, Smart Print Control automatically formats the document text, including the document title, header and footer, based on the specified font faces, sizes, etc. and automatically word-wraps text so that lines are appropriately fit on the paper, taking into consideration the paper size and paper orientation of the selected printer. The new version (4.x) of Smart Print Control enables you to also print Rich Text Format (RTF) files, RTF Data, HTML files, HTML documents from their source code as well as PDF files in full color with WYSIWYG (What You See Is What You Get), using just one line of code!. You only need to specify the file name and call the PrintDoc method, or just call the PrintRTFFile, PrintRTFData, PrintHTMLFile, PrintHTMLDocFromSource or PrintPDFFile method to print your RTF files, RTF data, HTML files, HTML documents or PDF files, respectively. Smart Print Control can be used in any 32-bit programming language that supports ActiveX (OCX) controls, such as Visual Basic 4 (32-bit), VB5, VB6, VBA, MS Office applications (Word, Excel, Access, PowerPoint, etc. ), Visual C++, Delphi, HTML, etc. The fastest file split-join utility on the planet! Split your MPEG, MP3, DVD and Database files with turbo speed! TurboSplit is a powerful ultra-fast file splitter for Windows, capable of splitting very large files into smaller pieces so that they can fit on multiple tape cartridges, CD-ROMs, ZIP diskettes, floppy disks, etc. TurboSplit is also useful when a large file is to be sent via email while the email server does not allow attachments larger than a specific size. The file can be split into multiple segments and be sent in multiple emails. VBGold TurboSplit is an essential tool for file download sites where large files can be split into smaller parts to be available for download. This gives the users a great flexibility when the download is interrupted for any reason where they can re-download only the specific failed file segment. Files split with TurboSplit can be joined back using either the TurboSplit utility or a free small executable (TurboJoin.exe) that is generated automatically when you split a file. This freely-distributable executable enables the recipients of the TurboSplit volume (the file parts) to join the parts without the need to have a copy of TurboSplit. TurboSplit was designed to work on all Windows 32-bit platforms (95/98/NT/ME/2000/XP). This also applies to the small executable generated by TurboSplit. Therefore, neither you nor the recipients of the TurboSplit volume (file parts) need to have different versions of TurboSplit or its executable for the different versions of Windows. Space and Defense Division, Saft America Inc.
Oriental Motor Boston Technology Group Inc.